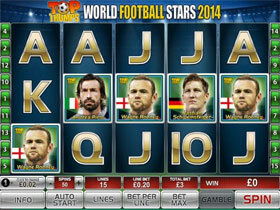 Top Trumps World Football Stars video slot from Playtech is another in the Top Trump series with famous players of the modern era displayed across the reels. Such greats as Ronaldo, Messi,Gerrard and Rooney are included. The game is full of interesting features like wilds, scatters, free spins and an exciting bonus game. Top Trumps World Football Stars will have great appeal for the game's aficionados, however with a possible top Jackpot of $500,000 waiting to be scooped many other players will be keen to play. 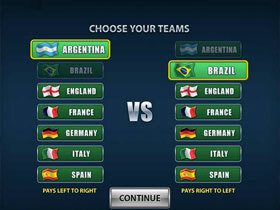 The idea of the game is to select three of the best players of your choice into two teams and arrange home and away games. The available players are all current icons so the heroes of yesteryear do not feature. These teams then compete against each other and great audio helps to create the right atmosphere. Of the three chosen players when one appears on the first reel together with a football on the second you enter the Bonus game. 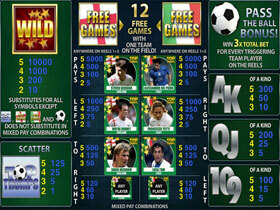 A ball will be passed between the players and should the pass be good you win with a multiple x3 of your wager.